Ramallah, West Bank - "I stopped counting after I had received 50 death threats. 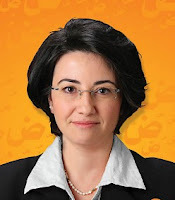 I told my secretary not to tell me about them any more," Arab-Israeli Knesset (parliament) member, Haneen Zoabi told IPS. "As a result of the death threats I’ve been given personal body guards both within the Knesset and outside," adds Zoabi. Zoabi, a member of the Arab-Israeli political party Balad, was on board the ‘Mavi Marmara’, part of the Free Gaza (FG) flotilla, when it was attacked by Israeli commandos in international waters as it tried to deliver humanitarian aid to Gaza several weeks ago. Following her arrest, interrogation and subsequent release Zoabi returned to a very hostile Knesset where she was subjected to a torrent of verbal abuse, including that of a racist and sexist nature. Some of the comments were so degrading and insulting that they were wiped from the Knesset record. Another Knesset Member (MK) was prevented from assaulting Zoabi following the physical intervention of other MKs. For video from Knesset confrontation, see Democracy Now's interview with MK Zoabi here. Zoabi has been labelled a "terrorist" and a "traitor" and the Knesset House majority has called for her parliamentary privileges to be withdrawn. The Israeli interior ministry has also called for her citizenship to be revoked. "I intend to take the matter to court, if necessary, to fight to keep my parliamentary privileges and citizenship,’’ Zoabi told IPS. Zoabi says that she and her fellow Arab-Israeli MKs have become the subjects of a witch hunt by a majority in the Knesset, but she has no regrets about joining the FG flotilla and would not hesitate to repeat her action. "It’s hard working in such a hostile environment where every move I make and every word I utter is subject to intense scrutiny,’’ she says. Zoabi recalls the horrifying ordeal the activists endured after the Israeli naval seals had boarded the ‘Mavi Marmara’ when nine activists were shot dead and dozens wounded. Survivors have accused the commandos of deliberately shooting some of the activists in cold blood. Turkish autopsies revealed that several of the dead had multiple gunshot wounds to the head. Zoabi did not witness any of the shootings or beatings of the activists but she questions the circumstances surrounding the deaths. "The Israeli soldiers had taken command of the ‘Mavi Marmara’ within 20 minutes of boarding. Yet it was an hour-and-a-half before they told all the passengers that the situation was under control and ordered us all to go downstairs. I wonder what happened in that hour," says Zoabi. "I went and held up a notice written in Hebrew to the window where the commandos were standing, calling for medical help. I also called out to them in English and told them there were critically injured passengers who needed urgent medical attention, but they ignored me. Two seriously injured passengers, who were bleeding, died after 40 mins,'' Zoabi told IPS. "Minutes after the attack began, the wounded and the dead were being brought inside from the deck,’’ Lubna Marsawa, another activist, told Electronic Intifada (EI), the not-for-profit, independent online publication which covers the Israeli-Palestinian conflict from a Palestinian perspective. ‘’We were then held for several hours with four bodies and dozens of wounded, some in critical condition. Blood was pouring from the bodies of the victims. We wanted to help them, but we had no medical equipment. There was nothing we could do," Marsawa told EI. Zoabi also accuses the Israeli authorities of trumping up charges against the passengers. "When they interrogated me in Ashdod port they accused me of attacking the soldiers, of threatening their lives and being in possession of knives. I just laughed in their faces, it was so ludicrous." Zoabi was released quickly due to her parliamentary immunity and the Israeli police have not tried to charge her with attempted assault against the navy commandos. She doubts whether the self-appointed Israeli investigation into the flotilla fiasco will be either credible or legitimate. "They will not question any of the commandos involved or allow the survivors to testify. Furthermore, [Israeli Prime Minister Benjamin] Netanyahu has already reached a conclusion before the investigation even gets under way. "He said the inquiry would prove that the commandos acted in self-defence and that Israel’s raid was in accordance with international law. What kind of legitimate inquiry is that?" The feisty Knesset member now believes that the relationship between Israel’s Palestinian-Arab minority and the Israeli-Jewish majority has reached a point of crisis and that the two communities are on a collision course. "The situation started deteriorating following the outbreak of the second Palestinian Intifada or uprising in 2000 when 13 Israeli-Arabs were shot dead by Israeli security forces during a protest against land expropriation," says Zoabi. As Israel’s increasingly right-wing Knesset tries to pass more draconian legislation, much of it with racist overtones, against dissenters and what it labels "traitors", Israeli-Arabs are being placed in an untenable situation. "They are forcing the Palestinian minority to choose between loyalty to Zionist values or being labelled "terrorists and traitors". ‘’This either or situation is not only undemocratic but will also backfire on Israel. Israeli-Arabs can’t be expected to follow the Zionist narrative or disassociate from their Palestinian roots," says Zoabi.